Online contests and sweepstakes are everywhere. “Can they work for me?” you – the online retailer – ask. YES! If you sell anything online to consumers – i.e. clothing, umbrellas, electronics, candles, vacation packages, cars, etc. – a Facebook Sweepstakes can help your business. “What EXACTLY can they do for me?” you ask. Let’s start with what a “successful” Facebook Sweepstakes is. You can define success by the goals you achieve. Goals you can accomplish by running a sweepstakes or contest: 1. Generate leads and sales 2. Drive traffic online and offline 3. Engage and delight customers 4. Boost Customer Loyalty 5. Grow fan base and generate opt-in & subscriber emails 6. Gain user data and insight ROI of a Facebook Sweepstakes or Contest Understand that a sweepstakes is about long-term ROI, not short-term. You are doing this to get new leads who will potentially turn into customers. You will spend money in the short-term, but in the long-term you will get an exponential amount back from your brand new customers. How? By following up with targeted marketing to entrants to turn them into customers. If you follow all of the steps below, each of your entrants will be interested in purchasing YOUR products. By adding them to your regular mailing list for new products & promotions they will purchase from you in the future. Why should I run a Facebook Sweepstakes or Contest? The beauty of Facebook is the propensity for users to share. Running it statically on your web page is going to get you no organic traffic – meaning you’ll most likely have to pay for it using ads. For the best-of-both worlds Wishpond allows you to run your Sweepstakes simultaneously on your website and Facebook. And no matter where they enter, each person who enters your sweepstakes automatically shares about it to their Facebook. Their friends see the shared post and click to enter your sweepstakes – giving you new organic leads. It’s tempting to give away something popular like an IPad or an Amazon gift card. But there is one fatal flaw in this decision: you’re only going to get new leads who are interested in IPads and Amazon. To make sure that every person who enters your Facebook Sweepstakes is interested in your products you need to make the prize either one of your products or a gift card to your store. I recommend giving away a gift card – this way it’s applicable to every person who is interested in your products, not just to those who are interested in a certain product. How big does my prize need to be? Don’t worry, you don’t need to give away $1000’s to generate interest. A gift card (or prize value) of $50 to $250 is enough to get people to take the time to enter. 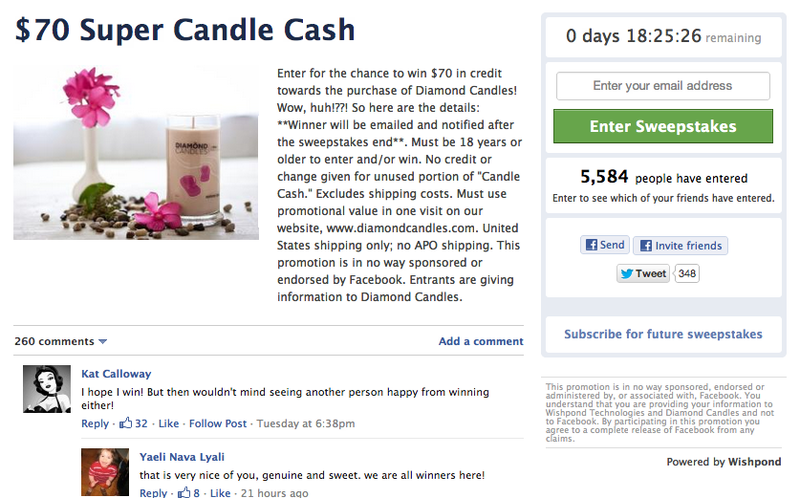 Our client Diamond Candles ran two Sweepstakes for $50 gift cards to their store and received 10,000 new leads alone. Your sweepstakes needs to start with a BANG to create a viral spread. Once you have your initial seed you can (somewhat) sit back and watch it spread through Facebook and grow on its own through the power of sharing. Where do I get this large seed? The best starting seeds are email lists, Facebook fans & Twitter followers. If these combined total AT LEAST 1,000 – 2,000 (and are especially email list heavy) your sweepstakes will have no problem growing on its own. Here is what I mean: If you’re giving away a gift card to your store, it’s a no-brainer for your current customers to enter – they love your products and would love a free gift card. When they enter your sweepstakes they all start sharing with their friends on Facebook. This gives you access to each entrants entire social network. They see the post made by their friend, click it to enter your sweepstakes and become a new lead for your business. I don’t have a big email list or a lot of fans on Facebook – what do I do? If you know anything about online marketing, you will know the power of ads – especially on Google and Facebook. If you don’t have a current base to start with these are perfect avenues to give your sweepstakes the boost it needs. Our Wishpond Ads Gurus are here to help if you need any information on how to use Google or Facebook Ads. A lot of sweepstakes require you to Like a Facebook Page, Follow a Twitter account or comment on a blog to enter. THESE ARE ALL TERRIBLE! How do you plan to turn these people into customers if you only receive a very impersonal channel of communication upon entry? Email is still king in online marketing and should be treated as such. It is personal and direct, and it’s what going to give you the best ability to convert your new leads. 40% of users access Facebook on their mobile phone. This means that if your sweepstakes is not accessible from Facebook by mobile you’re losing 40% of shoppers due to drop-off from being unable to access your sweepstakes. Not only that, but 80% of smartphone users are now using their phones to browse products and shop while mobile. This is like the number above – but double – for the % of people who will be unable to access your sweepstakes unless it’s optimized for mobile. ***SPOILER – Wishpond’s Sweepstakes app is optimized for mobile. Now that you have all of these entrants – what do you do with them to start making money? Start selling to them! If you followed our rules above about giving away something that you sell – or a gift card to your store – and not an IPad, every single person who entered is actually interested in the products you sell. This means that a high percentage of them will purchase products from you. But what is the best way to go at it? Once they find out they didn’t win the contest they may not feel super-great, so what can you do? Offer them a small incentive as a consolation prize – I recommend something like a 20% off coupon. Send it to them in an email, along with a few products that they might be interested in and you will get a high conversion rate – especially of first-time customers. ***NOOB QUESTION – How often should I run a Facebook Sweepstakes? Not every day. But certainly 1-2 times per month. Why? This will get traffic coming to your website ALL THE TIME, looking to see when your next sweepstakes is – this wil lead to people stopping by to look through your products as well – and the more time people spend looking at your products, the more often a percentage of them are going to buy something. Remember – people won’t just buy from you because you tell them – they will only (usually) buy a product because they actually need/want it – if they don’t want or need it at that time, they won’t buy it, so don’t expect them to be buying all the time.